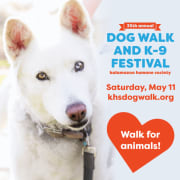 The Dog Walk is a great opportunity for you and your family, friends or organizations to volunteer together. We need volunteers all the way from paw print art to the bake sale tent, to set up and tear down. WE ESPECIALLY NEED A GROUP OF VOLUNTEERS TO HELP WITH PARKING. All volunteers receive an entrance wristband to the event for donating their time, so please enjoy the Dog Walk before/after your shift! Time varies depending on shift.